Just saw this today courtesy of The Fibromyalgia Network. It made me laugh on a day that I really needed a good laugh. To all those with Fibromyalgia or any condition which prevents one from exercising, don’t let the media get you down. I want to throw things at the TV when I see ads for gym memberships, walking/running shoes, yoga pants, etc., . We would participate tomorrow and do so with unbridled joy if only we could. Try not to scream at others when they complain about having to go to the gym. They have no idea how lucky they are. 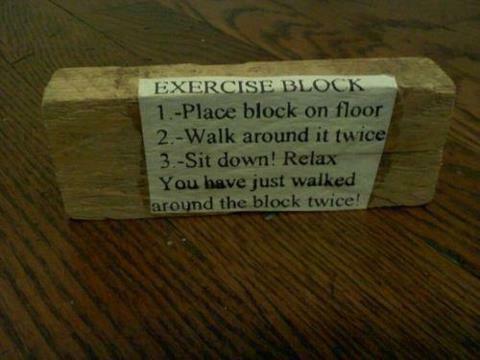 Those two blocks sited above … now that is a real work out for me. And many days I can’t even manage that. Sound familiar? Be kind to yourself. As I learned from TUT founder Mike Dooley (http://www.tut.com/Index/index), keep on doing the best you can from where you are with what you have. That’s it. That is your only job. Sounds too easy, doesn’t it? Well, never mind that. I speak from experience. Just do it and joy will find you. I promise.